WD My Cloud Business EX4100 0TB 4-Bay Diskless NAS with Marvel ARMADA 388. Centralized storage with anytime, anywhere access Store and organize your photos, videos, music and files in one safe place. Access and share them anytime, from anywhere. High-performance Powerful Marvell® ARMADAT 388 1.6 GHz dual-core processor and 2 GB DDR3 memory gives you ultra-fast transfer speeds of 115 MB/s upload and 107 MB/s download for high-performance media streaming and file transfers. Media streaming With the built-in Twonky DLNA-certified media server, you can seamlessly stream all your HD content to media players, Smart TVs, gaming consoles and other DLNA-certified devices. Comprehensive data protection Backup that's right for you Keep your irreplaceable photos, videos and files safe with multiple, automatic backup options for all the computers on your network. For PC users, WD SmartWareT Pro offers options for how, when and where your content gets backed up. For Mac users, utilize all the features of Apple Time Machine to protect your content. You can also automatically "back up your backup" to another offsite My Cloud Expert Series device or to a supported cloud service, including Dropbox, ElephantDrive and Amazon S3. Multiple RAID options Armed with multiple RAID options, you have the power to customize the system with the configuration that works best for you. Choose RAID 0 for enhanced system performance; RAID 1 for mirrored data protection; RAID 5 for data protection and best capacity; or RAID 10 for fast performance and ultimate data reliability. Other options include JBOD andning. RAID Roaming allows you to keep your RAID array intact when you move drives from one My Cloud EX4100 device to another. RAID Migration lets you change your RAID configuration and expand storage without losing content. Advanced data security 256 AES volume encryption provides additional protection for your valuable photos, videos, music and files. Recycle bin With this optional feature, deleted files are not erased completely from the NAS, but moved to a special folder and can be retrieved, adding a second level of defense against accidental data deletion. Easy to set up and manage My Cloud EX4100 comes preconfigured for easy setup and system management. The intuitive dashboard guides you through the process of setting up users and shares, customizing system features and monitoring your storage. And with a toolless and trayless drive bay design, drive installation and hot swap is effortless. Featuring WD RedT NAS drives with NASwareT technology My Cloud Expert Series pre-configured NAS come populated with WD Red NAS hard drives. Ultra-reliable and purposely built for NAS systems, WD Red drives improve performance and thrive in 24x7 environments. WD's exclusive NASwareT technology further optimizes WD Red for the NAS environment. From vibration compensation, optimized power usage and protecting your content in the event of a power loss or disruption, the firmware is designed to give you improved reliability and system performance. Enhanced media streaming and network redundancy Dual Gigabit Ethernet ports for link aggregation enhances network performance providing the best possible HD media streaming experience. It also provides for network redundancy should one network connections fail. Power redundancy Dual power ports offer the option of adding a second external power supply that will take over should the first power supply fail. Number of Total Expansion Bays. 0, 1, 5, 10, JBOD. Number of USB 3.0 Ports. 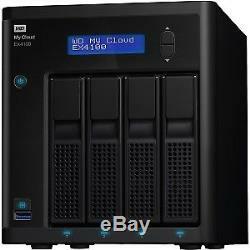 My Cloud Expert Series 4-Bay Diskless NAS with Dual-core Processor. The item "WD My Cloud Business EX4100 0TB 4-Bay Diskless NAS with Marvel ARMADA 388" is in sale since Wednesday, December 30, 2015. This item is in the category "Computers/Tablets & Networking\Drives, Storage & Blank Media\Hard Drives (HDD, SSD & NAS)\Network Attached Storage". The seller is "nothingbutsavings" and is located in United States. This item can be shipped to United States.